Studley and Astwood Bank station opened in 1868, along with the line, on what was then the Evesham and Redditch Railway, to be subsumed some 14 years later by the Midland Railway. The station lay on a single-track stretch of line with a single platform serving both directions. 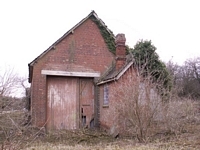 A goods yard catering for 55 wagons inhabited the site along with a goods shed, access to which was controlled by a signal box. 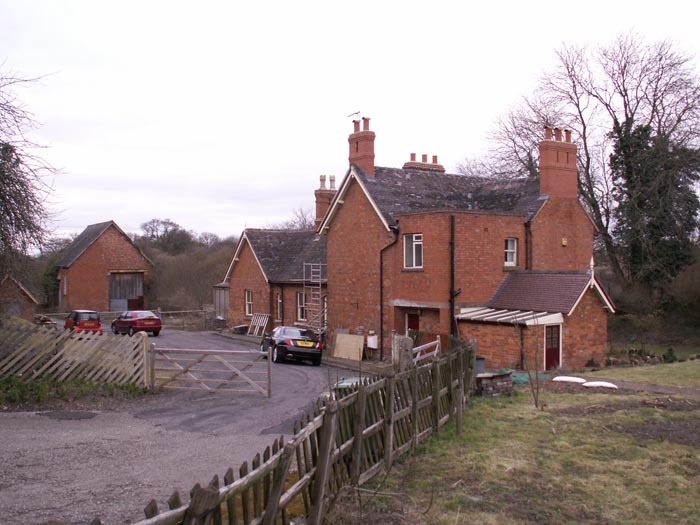 For a rural station, the goods facilities enjoyed significant traffic having pens set aside for livestock, domestic coal supplies, Pratts Petrol Co, Alcester Co-op and T.M. Dixon's timber merchants. 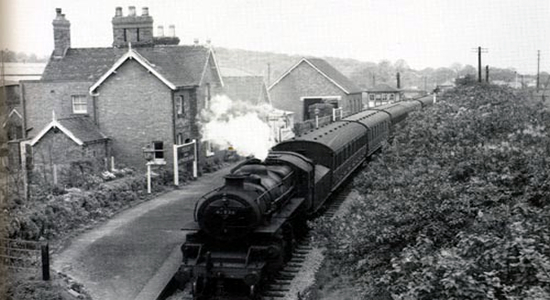 Passenger services, however, were withdrawn on 01/10/62 with goods facilities ceasing on 06/07/64. Above we see the station in 1957 (photo: T.J. Edgington) viewed from the then-extant A448 road overbridge, with Green Lane passing alongside the station to the extreme left: note the goods shed and beyond, the signal box. 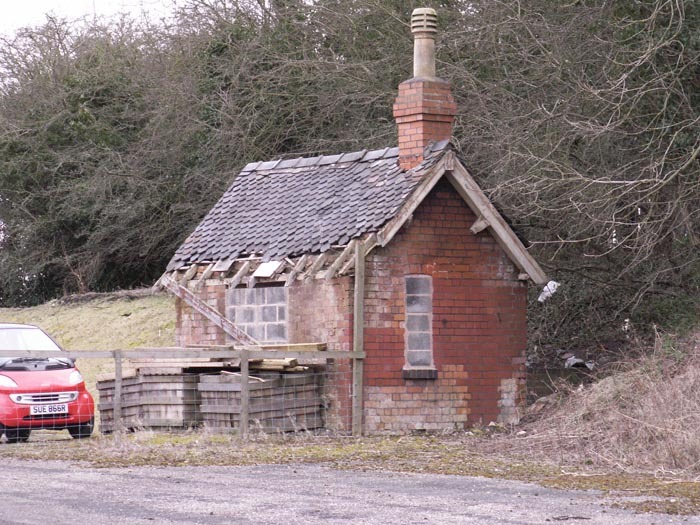 I have to admit to having been pleasantly surprised when I arrived at this location as a remarkable amount of the station is still in situ as can be seen above-left where we are standing on the corner of the A448 and Green Lane looking down the entrance driveway to the station. 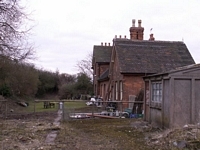 The station building itself is in good repair and converted into private dwellings however, more surprisingly, to the left of the photograph we can also see the goods shed still standing and to the extreme left, the weighbridge office controlling entrance to the goods yard itself. 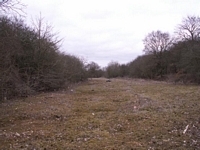 Above-right we have moved along Green Lane and are approaching the station site from the opposite direction to the previous shot. We are on the trackbed looking towards the station and can see the goods shed ahead with the site of the old signalbox immediately to our left. Above-left we are infront of the goods shed and can see that whilst it has been poorly maintained, with the doors broken and the windows filled with breeze blocks for some reason, it still retains its original features. The goods shed was of sufficient size to house one wagon at a time and, after peering through the hole in the door, is now lying empty (a malfunctioning flash preventing me from getting an internal shot). 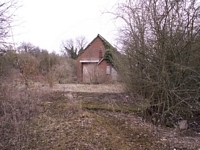 Above-right we have walked around to the other end of the shed, with the station to our rear, and can see the entrance from the roadway to the wagon loading area. 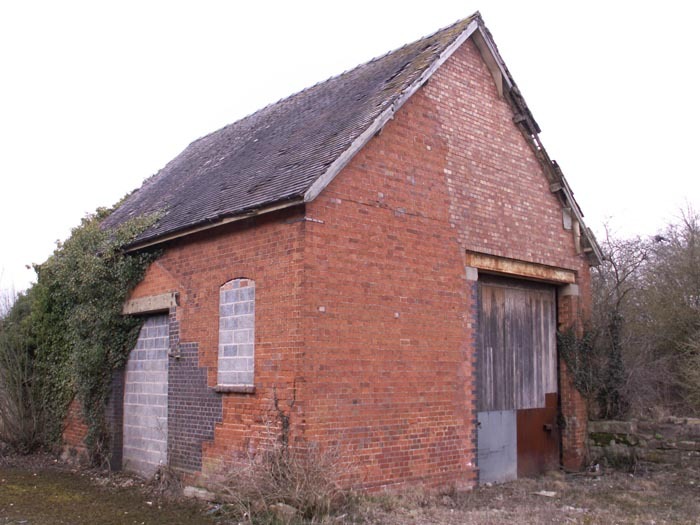 It is also interesting to note that significant brickwork has been undertaken on the shed at some point during its recent history: note the area above the RSJ over the track door to the right up to the apex of the roof. Interestingly, the entrance to our left to the shed once had its own cannopy, proof of this is evidenced by the cleaner area of brickwork above the bricked-up doorway. 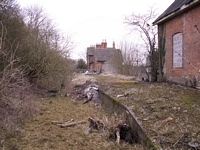 Above-left we are on the trackbed, looking towards Coughton, with the goods shed to our right looking along the single platform to the station building itself and beyond it to what was once a double-arched bridge carrying the A448 over the line which has since been removed. Above-right we take a closer look at the station building and can see that, despite the filling-in of the trackbed to create a garden for the property, the platform edging-stones have been left uncovered marking the passing of the platform through the now residential dwelling. 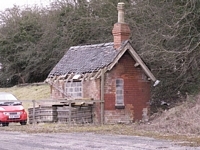 Above-left we have turned to our right from the previous shot to see the weighbridge office which once would have controlled entry to the goods yard by weighing incoming vehicles/carts to assess the fees due for carriage on the railway: unfortunately, the weighbridge itself is no longer in situ and was presumably cut-up for scrap upon closure. 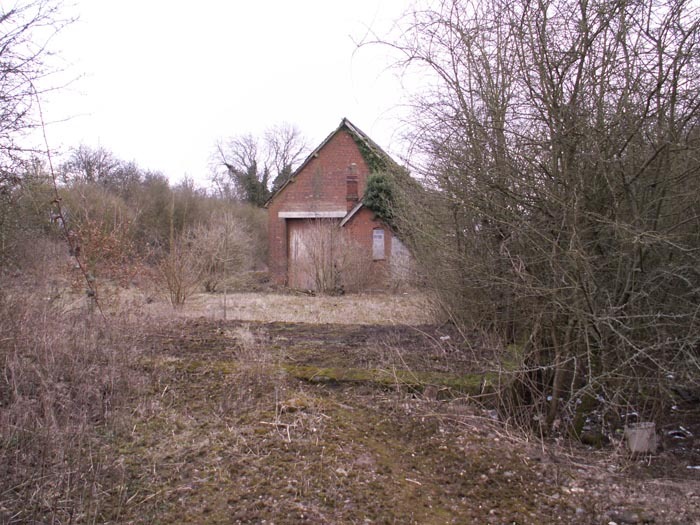 Finally, above-right we are looking towards Redditch with the station and goods shed to our rear. All-in-all this was an excellent site to visit and I can't get over the 'recently closed' feel to the site, it certainly doesn't feel as if the line was closed over 40 years ago!